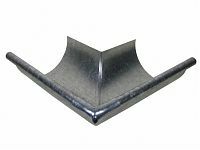 These miters are used for connecting two half round gutters at outside corners. We recommend installing the miters on the outside of the adjacent gutters with a 2" overlap. Soldering the seams is recommended but they can also be pop riveted and soldered.